There's a gem of a farm perched just below the summit of Scott Patent Mountain in Schoharie County—300-plus acres of hilly fields and antique apple orchards that are home to farmers Carol Clement and John Harrison's llamas, sheep, pigs, cows, goats, chickens, guinea hens, turkeys, bees, and a donkey named Sheila. Under the watchful eyes of Clement and Harrison, this small kingdom flourishes, thanks to a system of intensive rotational grazing which allows the animals to move to fresh pasture on a regular basis, giving the land time to replenish itself and providing plenty of fresh feed for the various species to munch on. No hormones, no antibiotics, and everything the farm produces is certified Animal Welfare Approved. The result is healthy, happy animals that yield lean, flavorful meats when their time here in this idyllic place draws to a close. 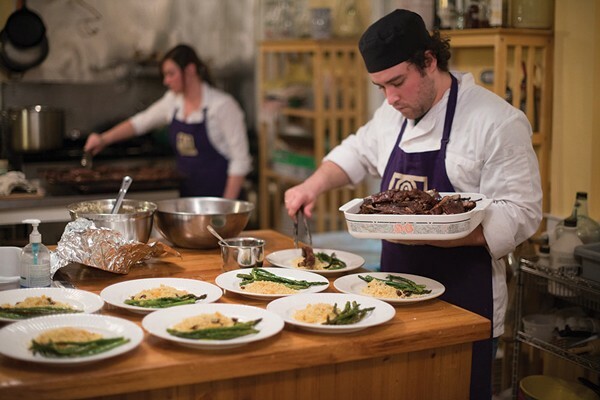 Once or twice a month, the farm hosts a remarkably delicious, five-course tasting supper starring farm-raised meats and seasonal specialty ingredients foraged for and prepared by chef Rob Handel, as well as fruits, vegetables, and cheeses from several local farms. 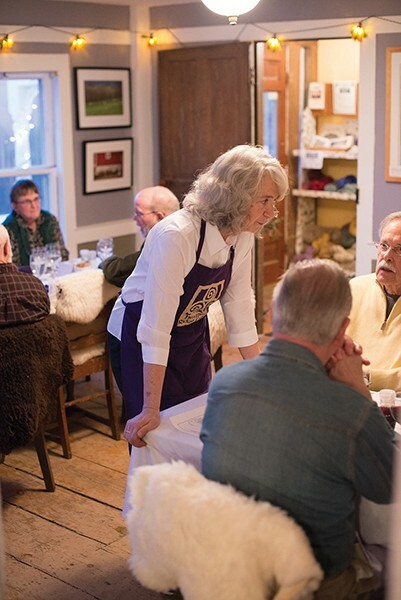 In the summer, they set up outside, in the winter, they serve in the farmhouse's small dining room but either way, it's a special experience. The sun is beginning to set as I arrive but it's still light enough out to take in the charming, yellow farm house perched on the hillside. The house probably looks much the same as it did when it was built in the early 1800s with the exception of the massive solar array that steps up the hill along its left side. 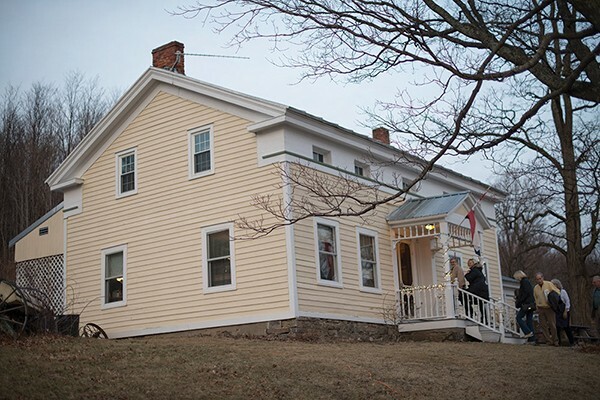 The modernized Heather Ridge farmhouse retains its 1820s looks and charms. Just outside the door, a brindled gray cat gives a friendly meow before rolling over a few times under the hydrangea bush in welcome. 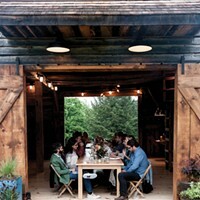 Inside, three tables are set in the farm's small, square dining room. The chair backs are draped with sheepskins in a variety of lengths and colors—mine is the luxuriously soft skin of an Icelandic sheep with long, black wool. 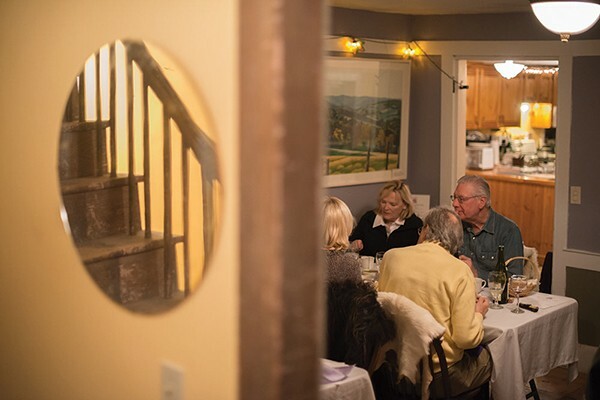 A lively buzz of conversation fills the air and the atmosphere is warm and welcoming, a tone set by Clement, a wiry, white-haired woman in her late 60s who is supremely comfortable with herself and her guests. Farmer Carol Clement takes a short break from serving to chat with her guests. I'm seated across from a fellow named Dwight who confides that Clement has a positive genius for seating arrangements—he's eaten at previous farm suppers with a Finnish sheep herder, a concert flutist, and an artist in residence at the SETI (Search for Extra Terrestrial Intelligence) Institute, among others. Next to Dwight is Clement's husband, Harrison, a salt of the earth Irish guy who grew up in the Bronx and is the kind of effortless storyteller who can make anything interesting. At the center of each table is a basket of cream-colored biscuits flecked with bits of green from the garlic chives chef Rob Handel has gathered. I break one open and slather it with yellow butter from a small ceramic tub. It's everything a biscuit should be—soft, warm, buttery—and more, thanks to the chives and cheese Handel folded into the dough. The farm does not have a liquor license but more than makes up for it by allowing people to bring a bottle of their own and offering swoon-worthy non-alcoholic aperitifs that could make even a hardened lush consider turning teetotaler. On this particular evening, Handel has prepared a locust and lavender shrub made with Handel's lavender vinegar sweetened with a locust flower syrup that he prepared last summer. "The locust trees only flower for about a week in June so after I harvest the flowers, I make a syrup that I can, and then it lasts the whole rest of the year," explains Handel. Added to seltzer and served with a twist of lemon, the combination is unexpectedly lovely with a subtly sweet floral flavor from the locust that floats on top of the slightly tangy lavender. I also sample Handel's farm-made root beer—a drink he created after tinkering with several recipes from the 1800s, "Root beer's heyday," notes Handel. His recipe includes more than 20 different roots, herbs, barks and spices that he simmers before adding sugar to create an intensely flavorful syrup. Added to seltzer, the result is a beverage so fresh, complex and woodsy that it is hard to put down. "I'm working on installing a draft soda system so that I can make it available on tap," says Handel. As the meal continues, more and more evidence of Handel's devotion to the dining experience accrues. Besides the spot-on flavors and textures, Handel's passion shows in little touches like the couscous that he hand-rolls and the way he pan fries the farm-cured pancetta to give the salty little cubes delectably crisp edges before sprinkling them over the silky fennel and apple soup along with a drizzle of lemon basil pesto that he made last summer. The pesto is just one of many ingredients Handel prepared in a previous season—his dedication to preserving the bounty enables him to produce flavorful, complex dishes even in the dead of winter. Before each course, Handel comes out of the kitchen for a few minutes to introduce the food and answer questions. He is small and slightly husky with dark, curly hair that is mostly hidden under a black chef's cap and the full lips and rosy cheeks of a Caravaggio cupid. He is also very young. At just 24, Handel seems remarkably focused and accomplished and also endearingly shy. The woman seated at the table behind me has taken his foraging class and was wowed. "He's casually intense," she offers in a tone of affectionate approval. Handel got his start as a boy, helping his grandma in the kitchen of his family's place—the Blackthorne Resort in East Durham. Clement is also a self-described "Catskills resort brat"—she grew up in the former Shagbark Inn on Route 212 between Saugerties and Woodstock in the 1950s. "I think it's one of the reasons that Rob and I collaborate so well," says Clement, "we share a background that focuses on creating good food and a nice environment to enjoy it in." Clement serves, stopping to answer questions, refill glasses, and chat. Handel is assisted in the kitchen by Amanda Hughes, the farm manager—a friendly dark-haired, young woman who started out as an intern a few years ago but quickly became much more. "I knew I could trust her right away," says Clement, who adds, "and she also happens to be very good in the kitchen." I try to pace myself—five courses is a lot—but find it difficult to leave anything on the plate. Some of the foods are a bit unexpected—like the guinea fowl terrine made with salted clementine, walnuts, and vin de noix which is subtly nutty and perfectly salted. Served with crostini, a spiced jam Handel makes from the damson plum trees that grow wild on the farm, a dab of whole grain mustard, and a wedge of Nettle Meadow's creamy, mold-ripened Kunik cheese, the combination is blissful. Once again, I clean my plate. I am also powerless to resist the siren call of the slow-roasted lamb breast ribs glazed with pomegranate molasses served with the hand-rolled, jeweled couscous and roasted asparagus. 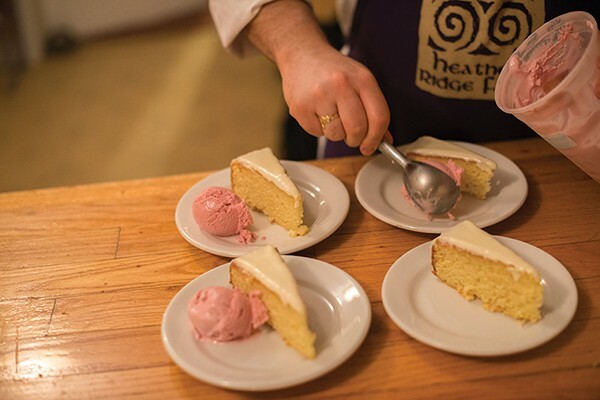 By the time dessert is served, I am nearing my limit but still enjoy the tart, creamy damson plum sherbet and the moist, airy white chocolate cake with tangy lemon glaze. The coffee—a custom blend that's freshly roasted by a friend—is excellent. It sounds sappy but you can taste the love in this food—the patience, humor, and affection with which Clement and Harrison raise their animals and the painstaking care and raw talent that goes into each and every component of the meal. Nor can I remember a time I've eaten a meal with strangers and felt so thoroughly welcomed, entertained, and nourished. Although I am quite literally stuffed, I leave hungry for more of this magical place. As Arnold Schwarzenegger said, "I'll be back." 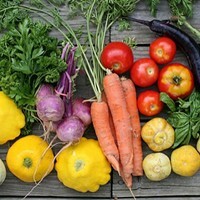 Farm suppers are held year-round (monthly in the winter and bi-monthly in the summer) at 6pm. 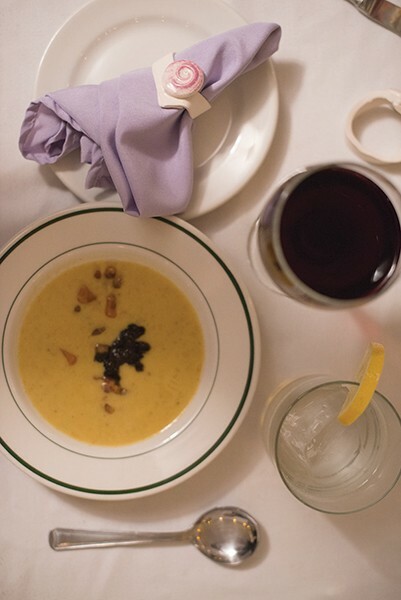 The next supper is on April 16. Price is $75 plus tax and gratuity. Reservations are encouraged since seating is limited. 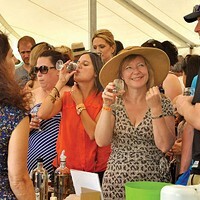 The farm, in Preston Hollow, is roughly one hour from both Kingston and Albany. For details: (518) 239-6234; Heather-ridge-farm.com.